The Fable series is back once again with a story full of triumph, decisions, and responsibility. You are one of two brothers to your Fable II Hero, and your brother Logan - current King of Albion - must be dethroned as he turns Albion into a world full of poverty, sickness, and harsh labor. You must rise to the occasion and construct choices, good or evil...or a little of both, to save Albion once again. Does the third installment to this blockbuster series live up to everything Peter Molyneux said it would be? Click to read on and find out! Presentation: When you first start up your journey, being Fable III, you will start off with a glorious cut scene of a chicken rebelling against all odds. Why does this matter? This simple, yet beautiful, way of bringing upon your ultimate quest using a simple chicken shows the story telling direction LionHead Studios wanted to take with Fable III. The story, and its presentation, are done in a way that anyone could understand and relate to. What it does though more than anything is really make you feel like a true hero as you go about. The direction LionHead took was definitely a step forward, story wise, as Fable III gives you a main goal along with the paths to achieve it. The addition of the Road to Rule is a brilliant new way of leveling-up, rather than the normal RPG's general leveling-up system. Everything is still at your arsenal like past Fables, but in a way that any fans new the RPG genre can pick up and enjoy themselves. Gameplay: Played any of the Fable's before this game? Especially Fable II? If so, Fable III will be very much the same to you. 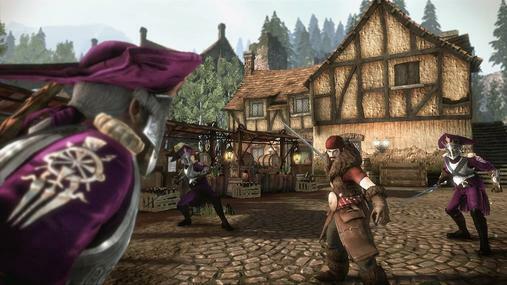 The control lay-out, battle sequences, and gameplay in general will be almost the exact some from the younger brother, Fable II. Battle wise, things have been cleaned up. More cinematics with amazing melee actions will make you laugh every time. Especially seeing a fully boney-body getting rattled apart as your sword enters their ribs. Shooting while facing an enemy will actually result in you hitting them instead of shots going berserk and going everywhere. Every once in a while a shot will completely go somewhere that I wasn't even looking at, but overall LionHead has cleaned up every aspect of combat. This combat is cleaner, but still the Fable that everyone knows. The game is still very easy; possibly easier than Fable II (hard to do that right?). You now have no health meter, but only a Call of Duty-type bleed out system, where your screen will begin to flash red as you inch closer to death. I shouldn't say death, rather than knocked out, which is essentially no big deal as you shouldn't be knocked down a ton. Say goodbye to menus, as Fable brings about a whole new system in the RPG genre. Your central hub now, dubbed your Sanctuary, has everything you need located in a kickass looking room your Dad (Fable II hero) left you. People have been raging over this since the release yesterday, saying that Fable III is dumbed down for players. This new menu system, though annoying in the beginning, really adds a fresh taste to the Fable series. Annoying at the beginning due to constantly going from game to Sanctuary, this menu system starts to become comfortable, and a brand new physical way to sort your items. Many old RPG fans will rant and yell because Fable III's items are listed in one spot to be equipped, dropped, etc., but in a physical way where, for example, you walk up to a mannequin and equip a new clothing item. This is understandable, as this truly is a new step in the Fable series, and RPG genre for that argument, but as the story progresses, it really is a fun and easy way to access your items. Graphics/Sounds: Fable III is here, and revamped, looking more beautiful than ever. The art styles in Albion are amazing as you go from snow covered mountains, to green valleys, to an industrial Bowerstone. Bowerstone in itself is impressive enough. You will truly see, in art style alone, how Bowerstone changed from Fable II to Fable III. Once a thriving place to live, has become a poor, laborized town ruled by the harsh ruler, King Logan (your older brother). The town truly is dark, eerie, and bleak, and adds to the story, showing you how crucial a rebellion is. There are a few graphical hiccups here-and-there, especially after saves. I have had to wait twenty or more seconds to start truly walking again after returning to the game from the Sanctuary. Though these occurrences are few, they are noticeable, and do detract from the game. There have been many gamers saying their game has crashed causing them to restart from a certain point. Though this has never happened to me, it is definitely happening to gamers. The voice-acting in Fable III is still beautiful, and heads above most games out there, but I truly believe that it did not take any steps forward. Reactions with the environment, besides water, will generally not get you a sound - for example: swinging my sword at a rock. The game still sounds great, and has that great Britain humor (very punny indeed! ), but still feels a lot like Fable II in that department. Replay Value: This is yet again a Fable game with the RPG genre attached; replay is high, as LionHead gives you plenty to do. The main quest will not take gamers a ton of time to complete, but don't let that put a damper on your spirits. LionHead has added many things to do, and many are tons more exciting that in Fable II. Side-quests are fun, silly, and exciting, while looking for gnomes to smash is something any achievement hunter will go for. Key-hunting is back, and will have you looking far and near to find all, and the Road to Rule will offer you a load of chests to open (trust us...it will take awhile). The thing that I loved to do in Fable II that I hoped would be revamped in Fable III are the mini-games that earn you gold. These are better than ever, adding more of a challenge to keep you from not gouging your eyes out. Pie making is my favorite; where you hit button sequences to create the pie. After a gold multiplier of 6-or-so, it gets intensely fast, and will leave you working on some hand-eye coordination. All-in-all, Fable III will bring you back even after the main quest is complete, but trust us, you will enjoy your time. A lot to do, and will leave you with another great experience in Albion. Fable III is back, that is for sure, and it is truly taking a step forward in the storytelling department. A story that many of you will relate to and love, it will still bring about the Fable concept: choices. Being good or evil will have its consequences, but this time they will really show. The game separates itself from past Fable games, but yet sticks to its roots. With a couple new features, a great main quest-line, and high replay value, Fable III is one of the best bang for you buck deals this year. Any fans of the series will love Fable III, and anyone wanting to take their first steps in the the RPG genre will come to know Fable III easier than most RPGs. This game is hard to pass up, so renting is at least a must, if not a full purchase, as DLC will surely follow in the upcoming months.